To live a prophetic life is to obey God whatever the cost, to speak His truth even when no-one wants to hear it, to be filled with the Spirit of God rather than the spirit of the age. 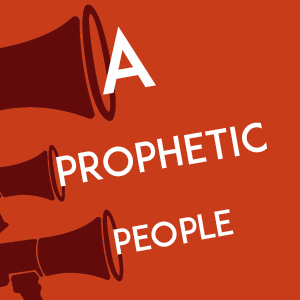 Our preaching series, “A Prophetic People” will explore what this can look like in Scotland today. The book of Hosea, although it tells the strange story of a man marrying an adulterous woman, is ultimately about God's love for his people. Today, it calls us to respond wholeheartedly to God. The book of Jonah is prophetic not because of the words Jonah speaks (only one sentence is recorded), but because his story speaks prophetically to us as the church today that we are to be people shaped by God’s mercy. If God can work with people like Jonah and use them, he can certainly use you and me. Lamentations: The least read book of the Bible? Lamentations is perhaps the least read book of the Bible. It was written at the time of the exile of Judah. The author, probably the prophet Jeremiah, personifies the nation of Judah as a grieving woman throughout the book. Isaiah 42: What does a prophet look like? What does a prophet look like and what do they do? Isaiah 42 shows us that they are both radically loving and radically truthful. This is an unusual combination but Jesus lived this way and enables us to do so too. The Bible tells all of us to expect God to speak today through prophecy, and shows us what this looked like in the life of the apostle Paul and the first Christians.